Make Thankful lists – This is something that you can do in so many forms. It’s one of those things that you could easily make into a cute craft to do with the kids or just be a good quick dinner conversation starter.. or both. It could take as long as you want it too and be as in depth as you make it. It can be just a simple verbal list that you and your partner share with your kids and vice versa or it can be something that you write down and discuss. The point is just to practice as a family being grateful for all the blessings God has given you ranging from the detailed things like that great cup of coffee in the morning to the over arching ones like the family God has used you to create and cultivate. 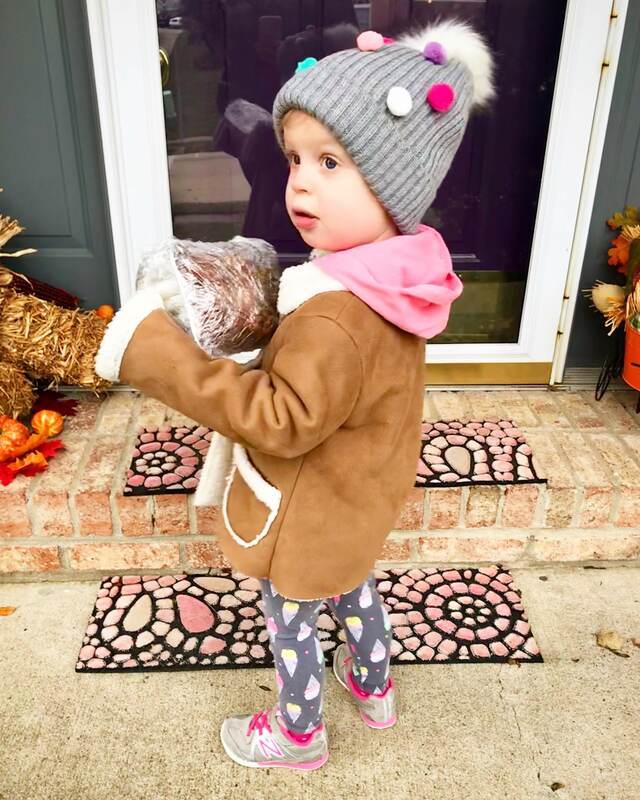 Make Thankful deliveries to your neighbors – This one we actually got out of our homeschool curriculum we are doing for preschool this year with Annabelle. It was so much fun though we are definitely going to make it a new Thanksgiving tradition! Sometime in November go around your neighborhood as a family and pass out goodies to your neighbors. We chose to make our friends some homemade Pumpkin Bread but it really doesn’t matter what you bring, whether it’s homemade or store bought, whether it’s something to eat or a sweet Christmas card to give encouragement. The point is to be intentional in telling those in your life you are thankful for them and that you value them. 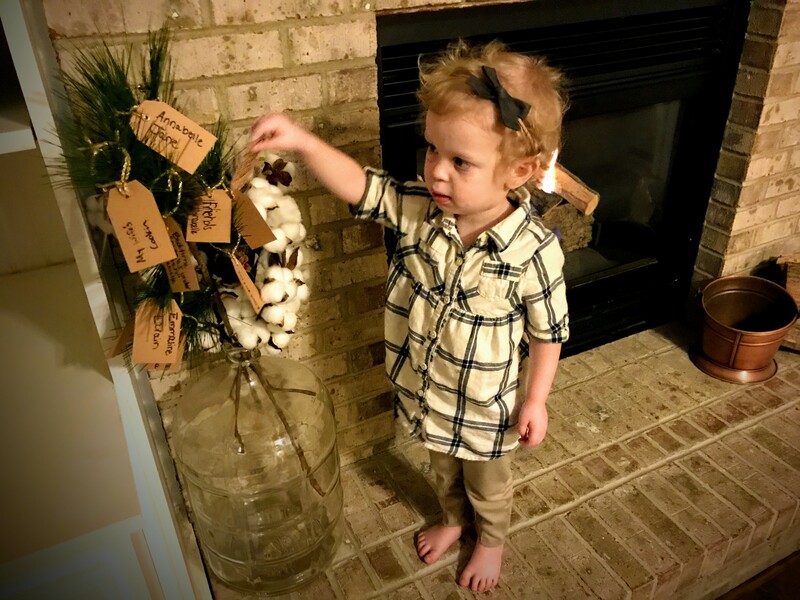 Display a Thankful Tree – This idea I totally swiped straight from Pinterest. It was one of those cute things I pinned for “one day” years ago before Annabelle & Emmaline were even a twinkle in their parents, as our grandmas would say. lol We could have done it in years past just the two of us and that would have been totally fine, but we waited until our family grew a little bigger and until Annabelle was really able to participate in filling out the tree with us, which was this year! It was so fun to fill out the little cards each day and hang them up on the branches with her. It was almost like an advent calendar for our blessings leading up to Thanksgiving. We actually decided to leave it up and incorporate it into our Christmas decorations this year too. 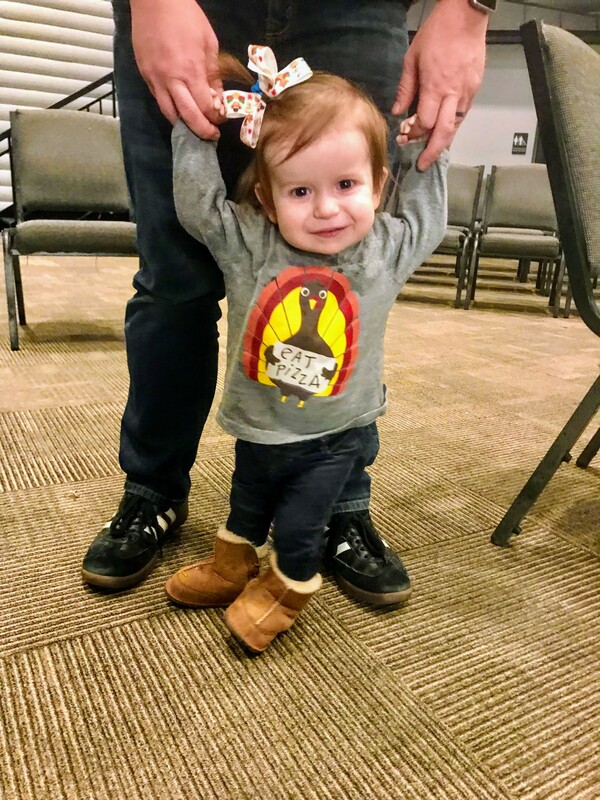 What I loved most about it though was getting to hear from Annabelle’s perspective what she is grateful for whether it was her baby sister Emmaline or chocolate milk and jumping in leaf piles. Getting to see from Annabelles perspective what is meaningful to her and what she is thankful for made this Thanksgiving so much sweeter. Talk about God’s heart for generosity and gratefulness – God is a giver. He loves to give good gifts to His children & when He does He gives freely and happily and in abundance. Therefore He wants us to give with the same joyful spirit because He knows how good it is for us. Talking about God to your kids doesn’t have to be some big daunting task. We actually prefer to just work God into daily conversations so it’s the norm for us to consider what He says and thinks in our family. For us this looks like counting the blessings that God has given us and being generous with others because God has been so generous with us. It also leads into reading our Bible with our children and memorizing a scripture to help us remember Gods heart on generosity and gratefulness. I am always blown away by how much children can soak up in their minds and their hearts. Again scripture memory doesn’t have to be some big scary thing. You can make it a normal practice in your family for all of you to do together and then it just becomes the way your family rolls. The verse we are memorizing this month is 1 Thessalonians 5:18 – Give thanks in all circumstances for this is Gods will for you in Christ Jesus. We have condensed it down to Give thanks for everything for our toddler though to make it easier for her to remember and we added a little praying hand motion as well which helps her remember it too. Give to a local organization to provide a Thanksgiving meal for others – We have been blessed to have a Thanksgiving meal as well as food on our table and in our tummies daily, but there a other families who this is a very real need that without the generosity of others (just like God has been generous with us) it will go unmet. Many local churches pack meals for families in the community and there are food banks that serve Thanksgiving meals to those in need this time of year too. 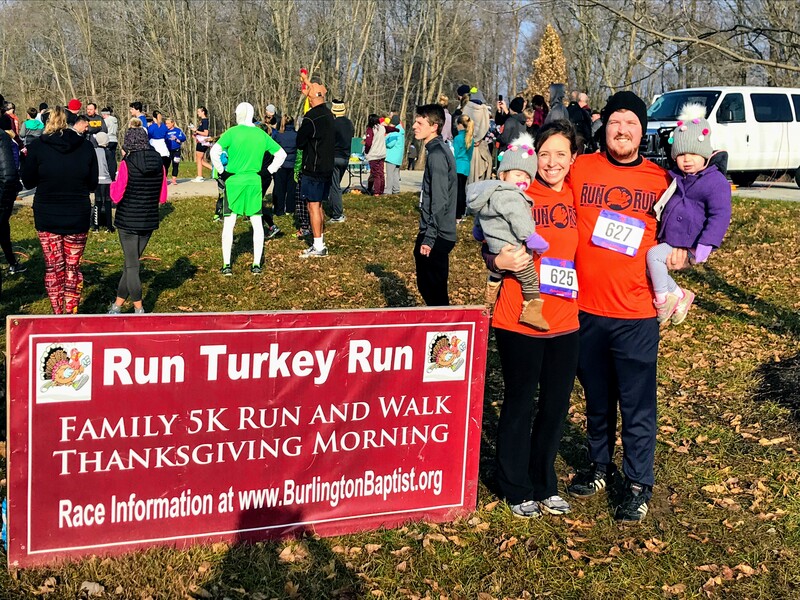 Or you could even find a fun Thanksgiving race to participate in where the proceeds go back to the community. Either way we would just encourage you to give back what God has given to you to use to help others the way He has supported you… and to make it fun for you and your kids. For children making things enjoyable is part of instilling a heart for those values. If they enjoy it they will want to participate in it again and again every year. So maybe that looks like going to the local food bank to serve a meal or to your local church to pack meals and then afterwards taking your kids out for hot chocolate and telling them how proud you are of the hard work they did and the kindness they showed. However you choose to do it this is a great way to serve those in the community that God has placed you together in as a family.